Poison Sumac Poisoning is often the accidental exposure to poison sumac leaves or other plant parts usually via physical contact. What is Poison Sumac Poisoning? Poison Sumac Poisoning may be also referred to as Poison Sumac Toxicity or Poisonous Sumac. What are the Causes of Poison Sumac Poisoning? What are the Signs and Symptoms of Poison Sumac Poisoning? The symptoms are usually seen within 1-3 days (and sometimes, after 5 days) following contact with the poison sumac plant. The severe phase of skin symptoms is typically between days 4 and 7 of exposure. 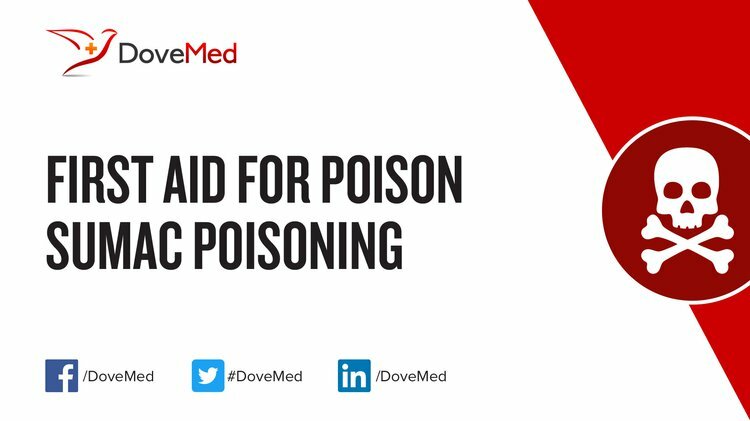 How is First Aid administered for Poison Sumac Poisoning? Who should administer First Aid for Poison Sumac Poisoning? What is the Prognosis of Poison Sumac Poisoning? How can Poison Sumac Poisoning be Prevented? Boelman, D. J. (2012). Treating Poison Ivy, Oak, and Sumac: Still No Magic Bullet—But a Range of Options, Old and New. Journal of the Dermatology Nurses' Association, 4(1), 46-49. Smith Jr, J. P. (2017). Poisonous Vascular Plants: A Bibliography of General References. Panwar, M., Laxmi, V., Chand, D., & Nautiyal, M. C. (2016). Antimicrobial Potential of Acetone and Methanol extracts of Rhus parviflora Roxb. Indian Journal of Forestry, 39(3), 1-4. Routledge, P. A., Good, A. M., White, J., Isbister, G. K., & Warrell, D. A. (2014). Poisoning due to fungi, plants, and animals. Oxford Desk Reference: Toxicology, 315. Allen, H. B. (2010). Vesiculobullous Disorders (Including Dermatitis/Eczema). In Dermatology Terminology (pp. 15-32). Springer London. Baker, S. J. (2011). The Poison Oak and Poison Ivy Survival Guide. Coleman Creek Press.